Fish chowder is a simple way to serve fresh or frozen fish. Fish chowder recipes make use of a wide range of ingredients and most chowder recipes allow for substitution or experimentation. Basic fish chowders tend to be classified as either dairy-based (white) or vegetable-based (red). Either type is delicious when prepared correctly. Fish suitable for fish chowder include cod, haddock, halibut, monkfish, grouper, snapper, striped bass, salmon, or other large fish. Firm, flaky meat is preferred. For a more flavorful chowder, smoked fish meat can be used. Before adding fish to a chowder, it should be skinned, de-boned, and any dark meat removed. This can be done during the initial fish cleaning or the fish can be poached and the meat separated after cooking. When using the latter technique, the stock is saved and all scraps are returned to the stock and simmered a second time. To master chowders, it is important to resist the urge to use specific measurements of ingredients. This is due to the inconsistency of seafood and other foods. A basic fish chowder usually starts with some form of broth or stock. As noted previously, some cooks make homemade fish stock using fish racks, skin, and other scraps. 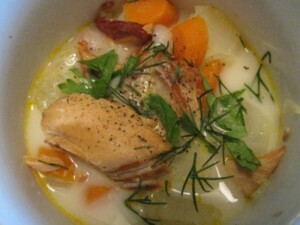 In lieu of fish stock, chicken broth can be used as a base for fish chowder. The main vegetables for fish chowder are usually potatoes, carrots, and onion. Some fish chowder recipes include asparagus, cabbage, celery, parsnips, lima beans, tomatoes, or a variety of herbs. Some chowders feature not only fish, but other types of seafood. Traditional American chowders often include other meats as well, especially bacon, fatback, or other high-fat cuts of pork. Before adding fish to a chowder, ingredients such as pork, vegetables, herbs, and stock should be simmered. For white chowders, this stage takes only a few minutes; just until the vegetables get tender. Tomato-based chowder should be simmered longer; until the tomatoes liquefy. As the chowder nears completion, the fish should be added. Withholding the fish until this stage is done so that the meat does not overcook and fall apart. In the case of white fish chowder, now is time to add cream or milk. When adding dairy products to chowder, the heat should be reduced and the mixture should be stirred while adding milk or cream. If a thicker consistency is desired, a mixture or half and half, butter, and flour should be used. Regardless of which form of dairy product is used, it is imperative that the chowder is stirred and simmered using low heat, otherwise the milk may scald. By adding small amounts, simmering, and tasting, the cook can produce a fish chowder with the desired consistency and richness. Salt and pepper to taste should also be added at this time. Once cooked, fish chowder can be served immediately with crackers, home made bread, or other sides. When available, fresh garnishes add color and flavor to chowders. Herbs suitable for use as a garnish include spring onions, chives, cilantro, dill, parsley, cilantro, and oregano. Some cooks prepare fish chowder in advance and store it overnight in the refrigerator before serving. Like many soups, fish chowder has much more flavor if chilled overnight and then re-heated before serving.